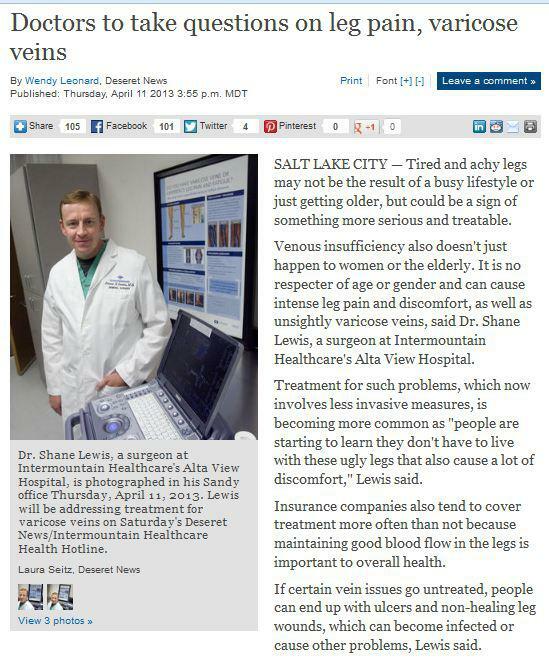 Medical professionals from Salt Lake City take to the news as they answered questions from the public about leg pains and varicose veins in the Deseret News. They discussed the consequences of leaving varicose veins untreated, as well as the common treatments that one can undergo to prevent further complications. Predisposing factors, such as genetics, gender, and age, and common misconceptions about the condition were also tackled. Now, you’re probably wondering what brings about the need for a varicose vein treatment from Utah dermatologists? First of all, you should know that varicose veins are essentially enlarged blood vessels. They are commonly found in the legs and are caused by defective vein valves which allows blood to leak back into the veins and collect there, making affected blood vessels tortuous and swollen. One of the doctors mentioned that varicose veins can lead to leg pain and discomfort, which are telltale signs of venous insufficiency or poor blood flow. Without proper treatment, individuals could end up with non-healing leg wounds and painful skin ulcers. Even worse, deep vein thrombosis (DVT) can occur, wherein a blood clot forms in a deeper vein that can quickly become life-threatening when the clot dislodges from the vein, enters the bloodstream, and blocks a major blood vessel in the lungs. Thanks to medical advancements and the latest technologies, there are now many available treatments for varicose veins that are generally safe, effective, and minimally invasive. If you believe that your legs are becoming too weak and hurting too often because of your varicose veins, schedule an appointment with your local dermatologist as soon as possible. Leading dermatology clinics in Utah like Stone Dermatology have established medical practitioners who you can depend on for the best varicose vein treatment. Take note that a sedentary lifestyle can also increase your risk of developing varicosities as much as your very genetics can. Therefore, if your job involves sitting behind a desk all day, you should see to it that you exercise on a regular basis and you could even get into sports. For women, it’s also beneficial to keep from wearing high-heeled shoes too often so as to avoid straining the legs. While an efficient varicose vein treatment in Utah is helpful, there are always steps that you can take to keep from developing the condition in the first place. If your work involves sitting for 8 straight hours, spend your free time walking around the office or stretching your legs. Moreover, be sure to visit your dermatologist regularly for a checkup, and arrange for treatments whenever necessary.